I'm squealing with delight about hosting this contest to give away a copy of Offbeat Bride: Creative Alternatives for Independent Brides! I consider Ariel of Offbeat Bride fame to be the pioneer in the movement to reclaim our weddings from the Wedding Industrial Complex. For years she has been dispensing advice and inspiration (via her blog and the first edition of her book) about how each of us needs to forge a path that makes sense for us as a couple. She is so sane, grounded, articulate, and inspiring. She definitely gave Matt and me the courage to plan the wedding of our dreams (instead of someone else's). Okay, enough gushing. I do have to disclose that I, too, am winning a free copy of this book by hosting this contest. I can't wait to get my hands on it. Leave your first name and first three letters of your last name in the comments section. Enter to win by Tuesday, April 13 at 11:59 EST. OOOH! I would love this! Yay! Thanks for doing this! So excited! 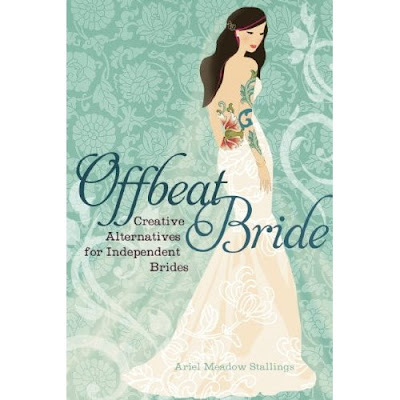 Love offbeat bride!!! Oh, I'd love to win this book! Ah! Just got engaged this past weekend -- this would be a great first book to read! Kara Gas. True story. Isn't that awful? Been following the OBB site for a while! I just came across your blog and I cannot WAIT to devour it all!!! This book would be so great to have!